I’ll bet there isn’t a southern African alive who isn’t transported by the fragrant perfume of a ripe guava. For me, it’s a smell of childhood. It’s the smell from a tree that drifted through my bedroom window when falling asleep on a summer’s afternoon. A tree that provided shade for our afternoon tea, succor to hundreds of fruit bats, and exploding pink sticky missiles with which my elder brothers tormented me. Native to Latin America, the guava is regarded as a “super-fruit.” I’ve read that while pineapples provide 131% of the RDA of vitamin C in a serving, guavas provide a whopping 628%. It’s also loaded with fiber and antioxidants. Guavas being washed and prepped for freezing at the beginning of the year . Chris teases me about my obsession to waste as little as possible. As the freezer space is overtaken with produce from the garden, often frustrating his attempts at finding food he wants to use, he will grouse and bet the fruit and vegetables will only see the light of day when they’ve passed their eat-by-date and are heading for the compost heap. This is what often happened before my arrival on the farm. This is a great incentive to prove him otherwise. Other than papaya and strawberries–about which I will soon be blogging–we haven’t much fresh fruit in our garden at this time of year. It’s as dry as peanut shells. And even though flowers, buds and leaves are unfurling among the pamplemousse, the pomegranates, and everything in between, the fruit will only be ripe over Christmas. It’s to the freezer I turn, then. And in it are bags of guavas which we put away during the rains. In season, guavas are delicious raw, eaten skin and all, like an apple. As children, we were fed hot stewed guavas served with lots of cream and brown sugar. Nursery food. Frozen guavas can be turned into an aromatic drink or syrup, or a delicate coral pink ice cream, sorbet, or fool. As a jelly it’s a terrific condiment eaten with cheese or roast meats, while nothing beats it on fresh bread slathered with farm butter. 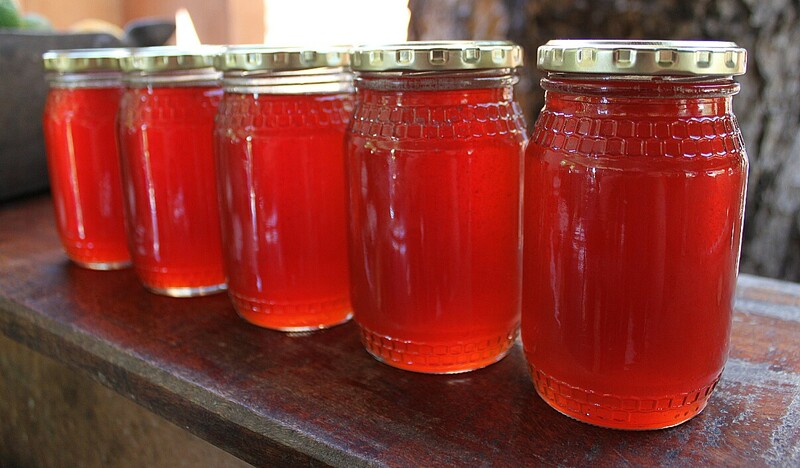 Our family always ate guava jelly alongside roast pork or lamb, as well as ham and turkey for our Christmas lunch. I’ve learned the hard way that guava jelly can be a challenge to make when using fruit that was skinned before freezing. 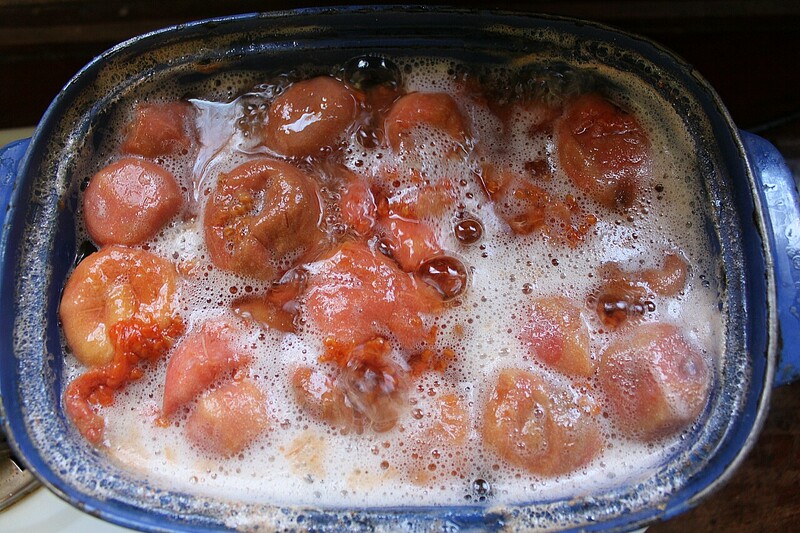 There’s lots of pectin in a fresh guava, and it is better suited than a frozen guava, to making jelly successfully. That said, I needed to make some now, using frozen fruit, so I decided to lob in a couple of pectin-rich apples that could abet the setting process. (Under-ripe tart apples are best for this, but I used what we had in the fridge.) I also chose to include a spice, just to see what the outcome would be, so added a stick of cinnamon into each batch. While this was good–a reminder of Christmastime in a cold climate–we felt the jelly was probably best unfettered. The cinnamon seemed to overpower the delicate and fragrant guava. Below is the recipe I used, bearing in mind that I split the ingredients into two batches. It’s advisable to make the jelly in quantities no larger than 5 cups of juice to help the setting process. 1. 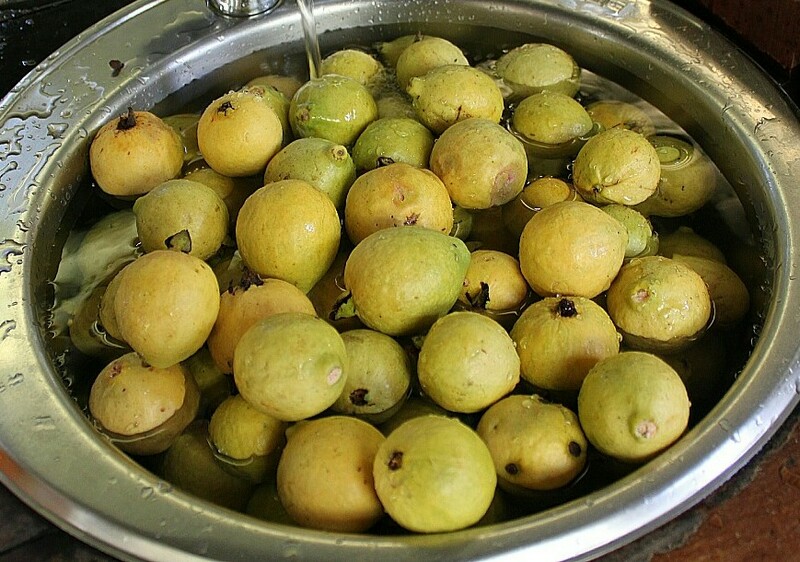 Fill a heavy-based pot with chopped up guavas, just cover with water, and boil until they turn to pulp, about 1 hour. If using fresh guavas, wash well, and then chop up the whole fruit, including the skin. Boiling guavas turning into pulp. 2. Remove from the heat, cool slightly, and transfer the pulp into a jelly bag, or as we used, some mutton cloth fashioned into a sack. Set over a large bowl to catch the drips from the guavas. Leave for a minimum of three hours, or preferably overnight. The jelly bag we fashioned out of mutton cloth, hanging above a bowl we covered with netting to keep out the bugs. 3. Sterilize the jelly jars. Wash in warm soapy water, dry, and then place on a baking tray in a hot oven (180/350 degrees) for 10 minutes. Put the lids in a bowl filled with boiling water for the same time, and then dry before using. 4. Put a small saucer into the freezer for testing your jelly when cooked. 5. Measure out two batches of juice, 5 cups each. Transfer to two heavy-based saucepans and add 5 cups of sugar, 5 tablespoons of lemon juice and one cinnamon stick, if using, into each batch. 6. Bring the syrup to the boil over a medium heat, stirring continuously. Add two apples to each batch as soon as the sugar has dissolved. Continue stirring regularly until the syrup thickens, about 30-45 minutes. If the syrup bubbles up to overflowing, turn down the heat. Skim off any white scum during the boiling process. I added two apples to the syrup to help with the setting process of the jelly. 7. Continue boiling until the syrup coats the back of your stirring spoon. Turn off the heat, remove the saucer from the freezer, and test to see if a spoonful will jell on the cold plate. If the jelly crinkles up and holds when pushed with a finger, it is ready. 8. Take the hot jars out of the oven. 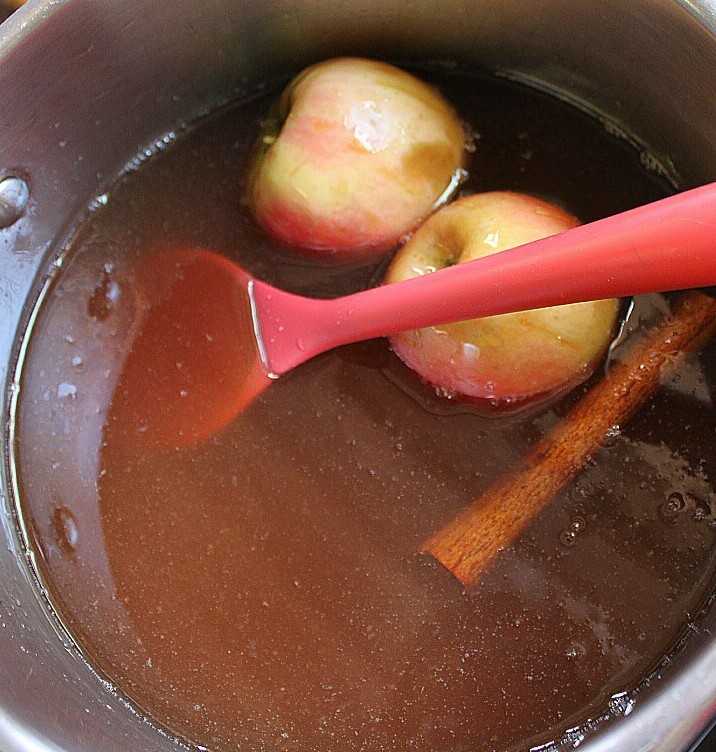 Remove the apples and cinnamon sticks, and ladle the jelly (through a small sieve if you’ve used apples) into each jar, and then seal it, ensuring the lid is capped tightly. Cool at room temperature and store away from sunlight, or in the fridge once a jar is opened. The jelly should last for months in the fridge. Note: A preserving tip from the Kenya Settlers’ Cookery Book – To prevent jam or jelly turning moldy on top, cover with a piece of paper soaked in brandy, white of egg or clear mutton fat, before screwing on the lid. I love your blog and have gone been transported back to my childhood this morning. Thank you for the wonderful recipes … I am certainly going to try the butternut ravioli soon. Finally – looks like I can comment from my ‘phone not my old computer. Just wanted to say I love all of this especially the quality of time I can feel squeezed into every stage of those red/gold jellies. I love the jelly but have no love of guavas. I can remember the big tree outside the headmaster’s house and all our booty – just something about the texture and taste of raw guava that ruined the prize. I love reading your anecdotes … and of course your writing. Shame you don’t love guavas! You’re missing out … ! I love guavas but coming from a non-guava eating family there was no guava jelly in my childhood. I can’t wait to try some Annabel. I can just imagine it with cold Christmas meats mmmm. Once again a tasty – sounding recipe. You make it sound so easy! My only (and last!) attempt at making guava jelly was many years ago when I was foolish and thought I could learn how to cook. The result was something rivalling a trampoline. We buried it at the bottom of the garden and it’s probably still there.